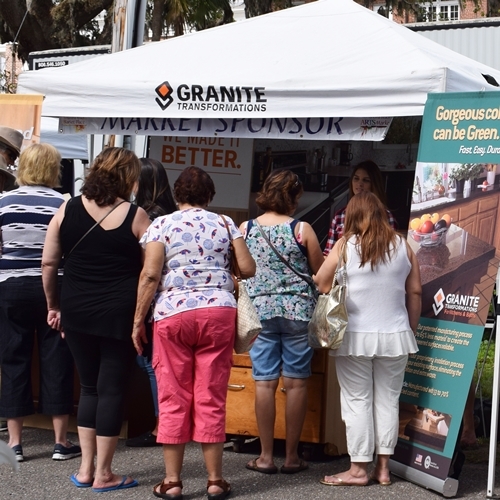 Granite Transformations of Jacksonville offers engineered stone slabs that they custom fabricate to install over existing services – kitchen countertops, shower walls, tub walls, backsplashes, fireplace fronts and more, usually in one day with no intrusive demolition! Their amazing stone material is non porous, maintenance free, and is heat, stain and scratch resistant. Their proprietary engineered stone is 95% granites, quartzes and other beautiful natural stone infused w/ Forever Seal, our state of the art polymer that makes their stone countertops the best on the market. This is not a low quality, toxic spray over application! GT has a lifetime warranty. All of their certified installers are their company so they don’t sub out installations – very important. They are A+ rated by BBB, Angie’s List Super Service winners and are proud that over 50% of their business is repeat business, customer referrals or word of mouth references! !